44 years ago, a great war known as the Valbanill War raged in the land. One of the war's most dangerous weapons was the Demon Contract, where a human could sacrifice his or her body to become powerful demon. Realizing the damages the contracts have caused the land, the surviving nations made peace and banned the use of the Demon Contracts. Here's my problem with manga (outside of the fact that sometimes I can't tell female and male characters apart), it can feel like an eternity for storylines to get going. The characters dance around the plot and finally, after a volume or two, or three, they finally get to the meat of what is actually going on. This happened a bit in The Sacred Blacksmith. It wasn't until volume four that things really get moving and become quite interesting. Cecily is a knight of Housman, protecting the city like her father and grandfather before her. 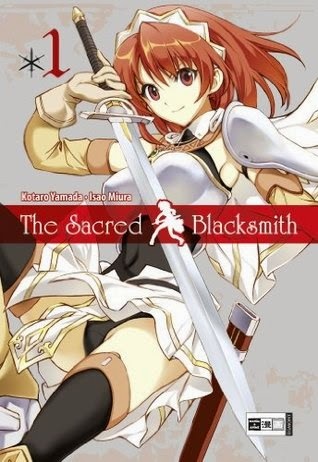 When a demon attacks, Cecily is assisted by the mysterious blacksmith Luke who wields a powered swords that gives him protection against the evil creatures that were once humans. There's a lot of back and forth between Cecily and Luke, a budding romance of sorts, and every time Cecily fights she loses her shirt...which I don't understand, at all. But the demons are really creepy, the action is excellent, and the story is building toward, what I can only assume, will be the ultimate battle. There is unrest in the kingdom. Everyone is vying for Demon Swords, powerful weapons that would allow ruling powers to dominate the countryside. And of course there is an evil brewing. Demon Contracts are being used to ravish the land. So, yeah, things are starting to get interesting. Look, sometimes, in the heat of battle, shirts get lost. Especially when they are part of what is obviously the worst-made outfit this world has ever known.